If you have made it this far, you have probably seen my poster at #COT2016 and used the QR code or URL to find your way here. 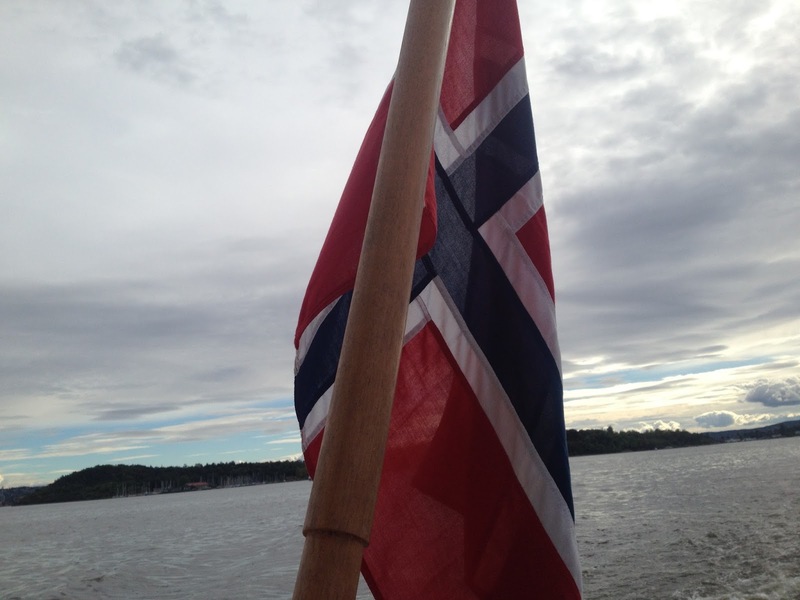 24 March 15: Applying for the role – Why did I apply? I’ve seen the tweet by the OTalk team about the student digital leader intern a few times now, I’ve even retweeted it, but can I actually do it? When I started studying occupational therapy, I had to give up a lot of my voluntary roles which I had done prior to the course, as I couldn’t commit to physically be there every week, with the commitments of commuting, university work and placements. But this reduced the roles I was doing and how I interrelated my own being and what I felt I was giving back to the communities I am part of. 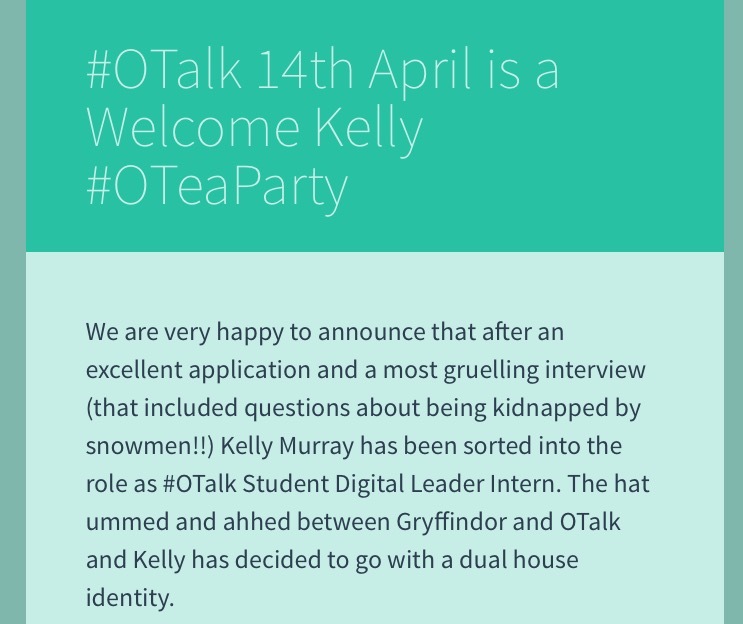 When the I saw the tweet about the #OTalk Student Digital Leader intern position, I was really intrigued about whether it would be something I could commit to? Could I put my effort and resources into this role? I've been utilising social media within volunteer roles, personally and within employment for a few years, so I knew I had a useful level of skills to bring to the role. But as a first year OT student, I worried about my lack of occupational therapy knowledge and how this would impact on my ability to do the role. I had been following #OTalk as an OT assistant prior to starting the course after stumbling across it one Tuesday night and had been lurking for months, with the odd contribution, but still I wasn't sure If I could really do it? 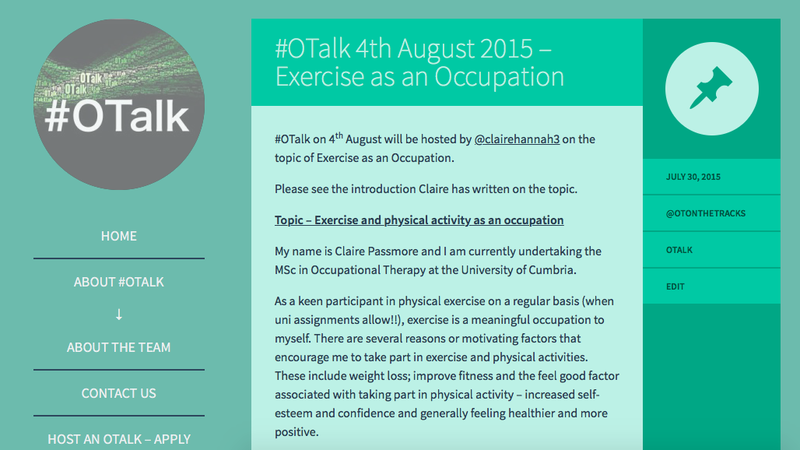 But I had been contributing more in chats as a student, and had even volunteered to co-host a chat with one of the occupational therapists who regularly contributed to #OTalk chats, so maybe I was ready for a bit of a leap of faith. Fundamentally, within the first few months at university whilst we are learning about the basis of the occupational therapy profession, we were also considering our role in the development of our profession both as students and as future occupational therapists. This was one of the main reasons I applied, I felt I wanted to be adding to the profession in some way, even as a student. A Skype interview, post co-hosting my first #OTalk was always going to go either way. Add into the mix that, it’s 9pm on day one of a new placement, you have no running water and the microwave in student halls added a rather horrid smell to your quick dinner. 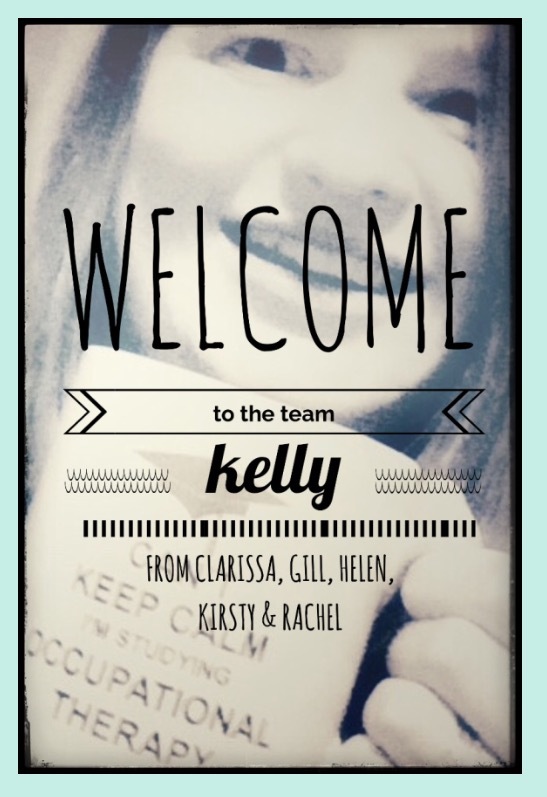 It was always going to end in hilarity… I was really thankful that even at the interview the rest of the #OTalk team were extremely welcoming, which actually made me feel part of the team from the outset. I was really excited to be offered the position whilst on the Skype call, which was a surprise after I had answered the tweet character question wrong on around 30 attempts. When Wilcock (1998) discusses being, it is very much linked to doing. 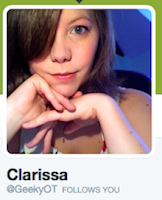 By starting a new role within the #OTalk & wider twitter community it impacted on my self-identity as a student. 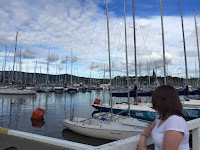 It meant I now longer could be an anonymous student within both the social media community or the physical face to face OT community either, which although at times is intimidating, has been a real positive in making connections and developing my knowledge as a practitioner. The #OTalk community enabled a space where, as a student I could ask questions and consider how the evidence base fits into a range of settings that I hadn’t encountered practically as a student. 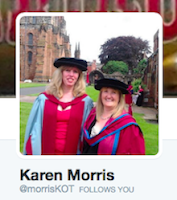 Being part of the wider occupational therapy profession on twitter has given me unending opportunities to network with other clinicians, OT students, researchers, academics and our professional body. During this chat I was able to refine my role more...in that, at interview we had discussed if I had a special interest or area I might want to develop within #OTalk whilst I was undertaking my internship and I had mentioned I would have liked to focus on student engagement. Thankfully the community appeared to have a similar idea so that enabled me to move forward with how this might look. How did this impact me? As I reflect on the internship, I can see how this positive feedback from the community enhanced my belonging in the role and wider community and gave me the confidence and security to undertake the doing of my role particularly when it came to arranging the Welcome to OT chat for new students. So one of my first tasks was to get to grips with the previous chats that had been by the community since they started - Quite a big task 4 years into the chat. This task was actually really fun to do for me, but did mean I kept getting see tracked reading the transcripts of previous chats as I came across ones that were really interesting and relevant to what I was studying that week in class, or areas of particular interest. This task also helped me understand more of the advantages of having students host chats, as I could see the discussions generated on particular chats and also the input of both students and practitioners and how the thinking on topics had developed. 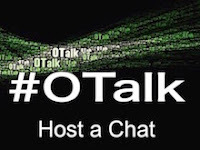 You can view a list of the previous #OTalk chats here. Stagnetti (2010) discussed doing as a means to develop skills for future doing. Considering this process within my role allowed me to consider the process of supporting others to host their #OTalk topics, enabled me, not only to build practical skills and strategies in online leadership but in turn skills in encouraging others development. It also enabled me to build my skills in working within the professional standards, focusing on social media use within the code of ethics. Wilcock (2006) highlighted the connectedness of belonging as important in all aspects of doing, being and becoming, and having the chance to meet up with the rest of the team for a research write up weekend, enabled the development of how much I felt I belonged within the team. This also created an opportunity to be mentored by the other team members, in turn boosting my confidence in both doing the role, and of the skills I could carry forward as I become qualified as an OT. 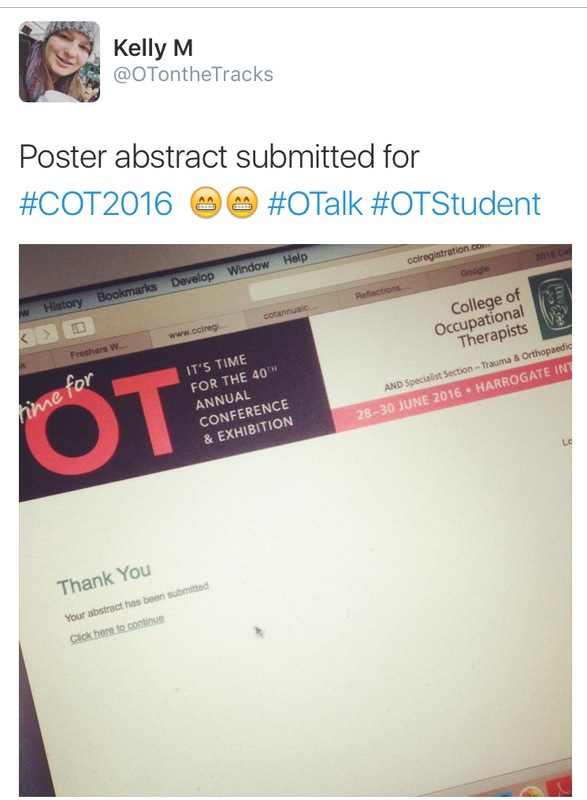 One of my main projects whilst on the team as intern was taking charge of the Welcome to OT #OTalk. 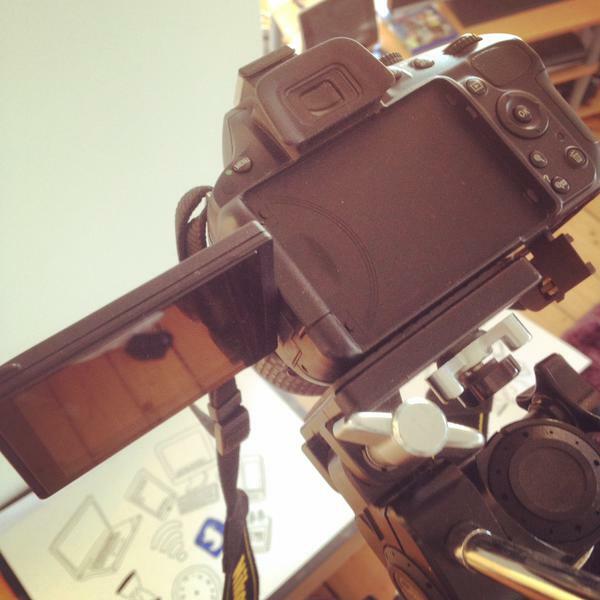 The plan was to utilise a video as part of the pre-blog to encourage students to get involved with the chat. This gave me a great opportunity to develop more skills in communicating the aims of the chat, liaising with a range of OTs, OT Students and educators and pulling a range of medias together to create the final video. The physical making of the video gave me a chance to reflect on the importance of doing, in impacting on being. The purposeful activity was meaningful to me as I developed in my intern role as it cemented my role within the team (belonging) and the impact I could have within the role as a whole (being). 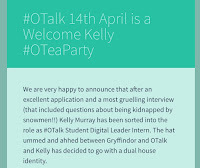 During the #OTalk meet-up, I was encouraged to share my experiences in some way at conference and I had mulled over the idea for a few weeks, and felt that it would be a great way of sharing the skills I had developed whilst interning and how I could take them forward into the OT Profession. 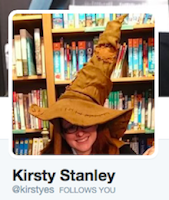 Thankfully Kirsty was willing to give me a hand developing my thinking on how best to present my ideas in a way that would utilise some occupational therapy concepts, which was really helpful. My first experience of hosting a chat on my own, almost happened by accident, as the team were working out how to fill a few weeks where we didn't have hosts or topics. Language and Culture came up as a possible idea, and since I had suggested it, I in turn volunteered myself to host the chat. This experience, gave me a chance to develop my research skills, as I searched for the theory behind how language and culture can impact on occupational therapists' practice. Writing the pre chat blog post gave me an opportunity to reflect and link that theory to what I had experienced on placement and in practice, skills crucial to my future practice. 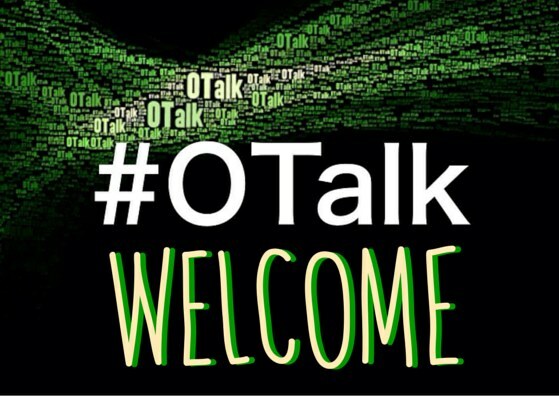 It's also important to note: You don't need to be an expert to host an #OTalk, you just need to have an interest in a topic that might interest the wider OT community, and #OTalk team can help you host the chat. On the night I was hosting, there wasn't many of the OT Crew around on the chat, which gave me a chance to step up and manage the account and keep everyone involved on track with the discussions. Reflecting on it after, I can appreciate that this was a really positive experience as I could be proactive in using the skills in managing the chats I had started to develop through supporting chats as well being able to help members engage in discussion. The process of doing enabled my confidence to increase and also my understanding of my own abilities. On the night, the actual chat was supported by the other OTalk team members which was really helpful as it was a really busy chat that needed more than one person to help and support the new members joining the chat for the first time. I chose to utilise picture slides in the key topic changes throughout the chat, as keeping up with the full chat can feel overwhelming when you first join, and I felt this would help new members of community quickly see when the topic was changing and bring them back into the conversation if they were feeling a little lost. It gave lots of opportunities through the doing of hosting that allowed for the development of special interaction (Wilcock, 1998) within the wider OTalk community to support new students in their transition into student occupational therapy life and allow for connections to be made with other students and OTs both locally and globally, which could aid their development and mine as we study to become occupational therapists. team I was able to spread the word about the use of Twitter and in turn help a few people learn how to use it in a more helpful way. The hard work began on how to share my experiences within the poster. If I'm honest getting my ideas from my head to the poster has been a challenge. I had the chance to further develop my support skills over the first few months of 2016 as I had the opportunity to support 3 members of the OTalk community host their topics 'Digital Assistive Technology: An essential skill for all OTs', 'Should there be changes to the way OT is taught in the UK?' and 'Clinical Reasoning – From Novice to Expert'. Supporting a number of chats in a relatively short space of time, helped me understand how differently individuals approach the chats and that impacts the level of support I was able to give to enable them to host successfully. Whilst interning, the #OTalk team were part of an editorial write up to be published in the British Journal of Occupational Therapy, and as part of the team, I was involved in this. ... I of course, jumped at the chance! 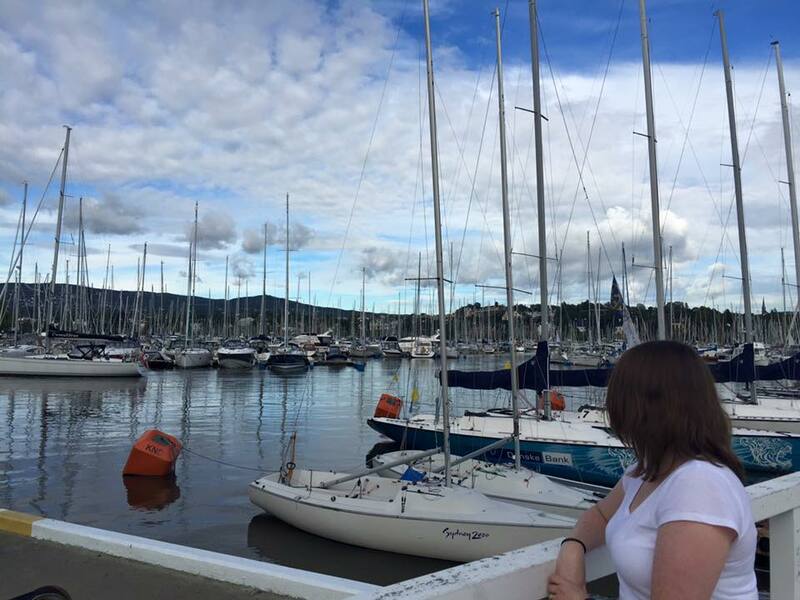 At points throughout the year, interning alongside studying towards my MSc was difficult. Managing my time effectively became crucial in allowing me to dedicate enough time to each of the aspects. Thankfully the #OTalk team were really understanding and always allowed me to put my study first, even altering the tasks I was to undertake within the internship to work around my available time. What Skills have I learnt & developed? Undertaking the internship assisted the development of my time management skills. 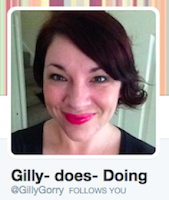 It also enabled me to develop my skills in prioritising tasks, to meet numerous deadlines in the same timeframe. Developed my skills in working appropriately with others (HCPC, 2013), within the team and wider profession. Developed my refection skills (HCPC, 2013), by reflecting on supporting and hosting chats as well as developing resources such as video. 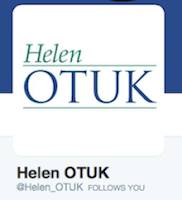 Learnt and developed Digital Leadership skills (OTalk, 2015), through the mentoring process within the #OTalk team. 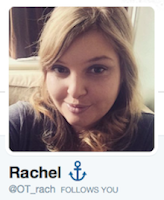 Enabling me to gain confidence in utilising social media within practice guidelines and legislation. Developing my research, critical thinking and EBP skills whilst preparing to host chats and taking part in #OTalk chats hosted by others. I would not have been able to learn and develop as much as I did if it were not for the support and guidance of the rest of the #OTalk team, who were always happy to answer questions, share knowledge and embrace my random and sometimes rather strange ideas throughout the year as intern. Health and Care Professions Council (2013) Standards of proficiency: occupational therapists. Available at: http://www.hpc-uk.org/assets/documents/10000512Standards_of_Proficiency_Occupational_Therapists.pdf [Accessed 11.09.15]. Hitch, D., Pépin, G. and Stagnitti, K., 2014. In the footsteps of Wilcock, part one: The evolution of doing, being, becoming, and belonging. Occupational therapy in health care, 28(3), pp.231-246. Molineux, M., & Baptiste, S. (2011). Emerging occupational therapy practice: Building on the foundations and seizing the opportunities. Role emerging occupational therapy: Maximising occupation-focused practice, 3-14. 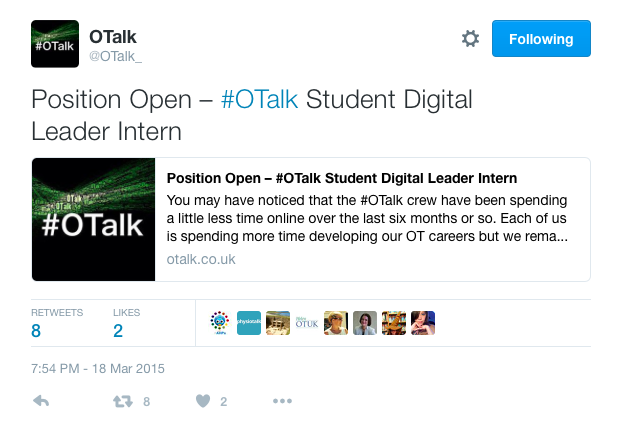 OTalk (2015) Position Open OTalk Student Digital Leader Intern. 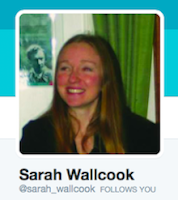 Available at: http://otalk.co.uk/2015/03/18/position-open-otalk-student-digital-leader-intern/ [Accessed 04.09.15]. 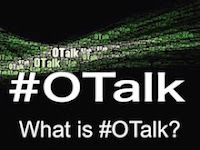 OTalk (2014) About OTalk. Available at: http://otalk.co.uk/about-2/ [Accessed 04.09.15]. Stagnitti, K. (2010). Play. In: MCurtin,MMolineux, & J Supyk-Mellson (Eds. ), OT and physical dysfunction: enabling occupation (6th ed., pp. 371–390). Sydney: Churchill Livingstone. Wilcock, A. A. (1998). Reflections on Doing, Being and Becoming. Canadian Journal of Occupational Therapy, 65(5), 248-256. Wilcock, A.A., (2006). An occupational perspective of health. Slack Incorporated.